Composting is a great way to recycle food and yard waste. Composting food waste lowers the quantity of food scraps you're sending to the landfill. Each year in the US, approximately 33% of household trash is food waste, yard waste, and non-recyclable paper waste, all of which can be composted. Composting helps extend the life of landfills by diverting food scraps to a higher use: nutrient-filled compost that is used by Vermont farmers, gardeners, and landscapers. When food scraps are added to a landfill, they release methane: a greenhouse gas 24 times more potent than carbon dioxide! 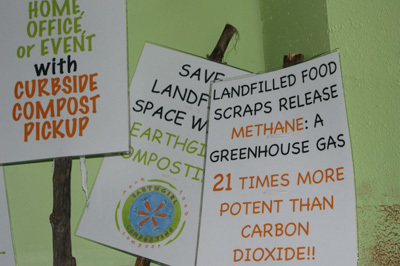 By keeping landfills free of food scraps, you are helping to protect Mother Earth from unnecessary pollutants. Compost provides an alternative to chemical fertilizers, making it possible for Vermont farmers to grow using sustainable practices with locally-available products. When you compost with Earthgirl Composting you are supporting a locally-owned small business, the composting facility that processes the waste, and the Vermont farmers that use it. Compost improves soil structure, which helps soil resist erosion. Aeration is extremely important to soil health and compost helps build a soil structure that promotes optimal aeration. Many chemical fertilizers are manufactured from polluting or from nonrenewable resources such as natural gas. Compost is a natural, renewable, and non-polluting resource for your garden. Using compost instead of chemical fertilizers preserves finite energy reserves and reduces the demand for petroleum products that so often fuels aggressive foreign policy. Compost suppresses plant diseases and pests, reducing or eliminating the need for chemical fertilizers and pesticides. By lowering or eliminating the use of these pesticides and herbicides, you safeguard your health and the health of local wildlife; you also keep toxic chemicals from polluting Vermont's groundwater, streams and rivers, and ponds and lakes: including Lake Champlain. Compost greatly helps soil retain water and reduces runoff, which translates into less water usage and a lower water bill. Soil enriched with organic matter soaks up water and holds it like a sponge, making it a potent weapon against drought damage. One hundred pounds of humus (pure compost) holds 195 pounds of water! Compost enriches the soil by increasing its nutrient content and helping to create and/or maintain a neutral pH. Compost also improves the soil's ability to anchor plant roots. From flowers, to fruits and vegetables and luscious lawns, compost's nutrient-rich matter helps your garden grow healthy, strong and prolific.